as the request, lot of people need engineering and calculation of injection mold and mold design, so i try to make little software, the name is mold calculator, it's freeware so download it and you can publish it, now it still under development, in this beta version this software only provided various shrinkage formula. There are linear and volumetric shrinkage. Both methods are difficult to measure accurately. 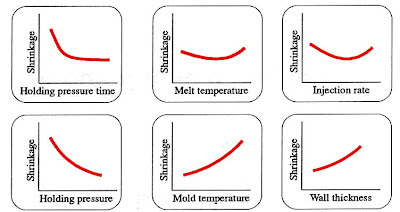 picture below shown relation between shrinkage and injection machine parameter. i try to make little software, more than 4 year never learn or make some program again, then now i still learn .net frame work, as the practice i try make this software, becouse I'm not professional software designer please don't hesitate to contact me, give some advice both in programming and mold calculation. 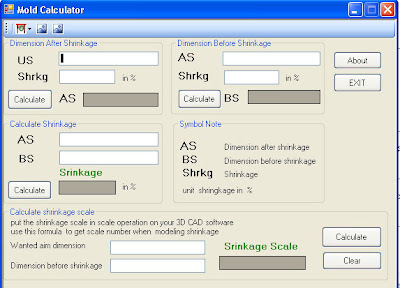 this software is still under development, on this version you can calculate, shrinkage value, dimension after and before shrinkage, and exact shrinkage scale to input in 3D modeling software. Thank you so much guys for providing such a good stuff, it will mostly educate the students.